Patsy Marie Vinson Martin, daughter of James William 'J.W. Vinson and Stella Ulene Kitchens, married Jimmy Ray Martin and will be buried in Buffalo Gap Cemetery, Buffalo Gap, Taylor County, Texas. BUFFALO GAP: Patsy Marie (Vinson) Martin, 74, passed away on Saturday, September 17, 2016. A graveside service will be held at 10:00am on Wednesday, September 21, 2016 in the Buffalo Gap Cemetery, Chuck Gililland officiating, directed by Fry~Smith Funeral Home, Tuscola. A visitation will be held on Tuesday, September 20, from 5 to 7pm at the funeral home. Patsy was born to J.W. and Stella (Kitchens) Vinson on May 26, 1942 in Ranger. 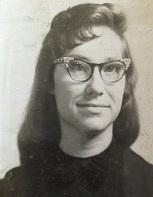 She attended school in Ranger and graduated high school in 1960. She was a majorette and voted basketball queen while attending college in Ranger. Patsy married Jimmy Ray Martin on August 18, 1962 and moved to Abilene where she worked at Thortons Department store. In 1963 they welcomed their first child, a daughter named Kelli and in 1967 a son named Kirk. She and Jimmy Moved to Buffalo Gap 1976. It was a year later that Patsy volunteered to sub for the Buffalo Gap Elementary school cook for a couple of weeks, after 26 years of “subbing” she retired from the school as head cook. Her loves were her family, grandchildren and great grandson. Her second love were Christmas, summertime and Elvis. At the time of her retirement, the faculty at Buffalo Gap presented her with a trip to Graceland. Her love for Elvis continued as she had dedicated a room full of memorabilia in his name. During Christmas time, she often told people that she put up so many lights outside that she could not turn on her Christmas lights and microwave at the same time without blowing a breaker. Patsy is survived by her husband of fifty three years, Jimmy of Buffalo Gap; daughter, Kelli Ethridge and husband Keith of Tuscola, son Kirk Martin of Tuscola, brother Rickey Vinson of Las Vegas Nevada, brother Dewight Vinson of Eastland, five grandchildren and one great grandson. Her parents and one sister Rita Munoz (2016) precede her in death. The care that Patsy received from the staff of the Winters Nursing Home was outstanding, and the family wish's to extend a thank you to each one of it's staff. In lieu of flowers donations can be made to The Texas Tech Health Science Center, Garrison Institute on Aging, MS 9424, 2601 4th St, Lubbock Tx, 79430.